Discussion in 'POTW Collaboration' started by Serebii, Dec 30, 2018. Time for the next Pokémon of the Week. This week, we focus on the Legendary Pokémon of Hoenn! Primal Groudon is arguably the most powerful pokémon in the entire game. Ground/Fire is a tremendous type combination which is only weak to Ground thanks to Desolate Land. And Earth Power isn't that widely spread, while the other Ground moves are physical and Groudon can easily take those with its tremendous physical bulk. Base 180 attack combined with Swords Dance access makes sure it hits very very hard. With the right support in doubles, there is nothing that scares Primal Groudon. I've been running this with Trick Room support. Ideally you use a very slow Trick Room setter which can also use Skill Swap and Gravity. I personally like Stakataka for the role. Skill Swap resets Desolate Land to remove the weathers caused by Primal Kyogre and Mega Rayquaza, and can give Groudon a new ability. Stakataka gives it Beast Boost, which Groudon doesn't really need that much (Precipice Blades tends to destroy teams already at +2 without needing more power) but is still terrifying and comes into play more if you didn't manage to get Swords Dance up. Gravity is Gravity on the partner, ideal to boost Precipice Blades's accuracy so you won't get those unlucky misses anymore, and it also pulls down all those annoying Levitators and Flying types like Yveltal, Mega Rayquaza, and Ho-Oh to be destroyed by Precipice Blades. Primal Groudon's STAB combination is completely unresisted in Gravity conditions outside of Water Bubble Araquanid (and Dewpider). Precipice Blades is the move to spam. A lot of power, almost unresisted with Gravity support, STAB, hits both opponents, and perfectly accurate in Gravity. It is terrifying. Fire Punch is a way to inflict damage when the enemy has Wide Guard and hits the occasional Grass or Bug Type for super effective damage. Swords Dance is the boosting move, set it up while the partner sets up Trick Room, Groudon is bulky enough to get away with it most of the times, and Protect is primarily filler but still useful from time to time in doubles. The EVs are quite straightforward. Max attack to hit as hard as possible, and max Sp.Def to get extra bulk against special attacks. Max Sp.Def allows Groudon to survive some heavy special attacks better than a max HP investment would give you (like some Z-Moves, Adamant Orb Dialga's Roar of Time, and Specs Kyurem-White's Ice Beam for instance). 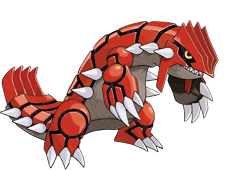 Groudon doesn't need more bulk in its physical defence with its base 160 defence stat. Primal Groudon is one of the most overwhelming Pokémon in the game, second only to Mega Rayquaza, and the face of the Uber Tier. Primal Groudon is seen on just about every team, and every team MUST have at least one Primal Groudon counter, lest they get steamrolled by this inexorable continent. Double Dance Primal Groudon. Bring in late game after the opposing Primal Groudon counters have been weakened or killed, setup and steamroll your opponent to oblivion. EVs are to maximize special bulk, as Primal Groudon's Defense is fantastic and gives Primal Groudon more chances to setup. Precipice Blades is for STAB and Stone Edge is for the fliers that would otherwise wall this set. Fire Punch is not being considered here, as that would enable Primal Groudon to get walled by Ho-oh, Giratina-O, Mega-Salamence, and Lugia. 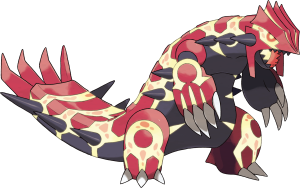 Stealth Rock -Primal Groudon is one of the tiers premier Stealth Rock setters and as such always worth a consideration. Assault Vest/Choice Scarf -Why are you using Groudon again? Primal Groudon needs that Red Orb. Bulldoze/Rock Tomb/Thunder Wave -Speed Control options. Bulldoze is worth some consideration in doubles. Groudon! He's a favorite among kids my day because he looks like a colossal dinosaur sporting some kind of armor. Just look at him! He's just so happy, you just want to hug this giant monster! So Groudon! His most well-known appearance is arguably False Groudon from Jirachi Wishmaker. Other than that, that's pretty much his only well-known appearance in the anime. I'm not even kidding, I asked around and a lot of people don't remember Groudon or what he did in the AG series because he pretty much did nothing. Then there's the Mega Evolution special, turns out a lot of people missed that special but it doesn't turn down the fact that it showed off just how badass Primal Groudon's Precipice Blades are, the anime crew going all cards in on Michael Bay-explosions. However undoubtedly it's most important appearance is Pokemon Adventures Ruby & Sapphire Story Arc which is inspired by Disaster movies perfectly capturing GameFreak's vision to show just how terrifying Groudon & Kyogre really are and holy %$#@ is Groudon terrifying, revealed it to be one of the true final villains controlling Leader Maxie as the only thing it wants to do is satisfy it's bloodlust for battle against Kyogre, not caring what innocent people or Pokemon gets caught in it's battle. If you ever wanted to see Groudon terrifying capabilities captured and how it affects the Hoenn region, Pokemon Adventures Ruby & Sapphire arc is the way to go. Pretty straightforward set. Nothing really new with Primal Groudon this generation.